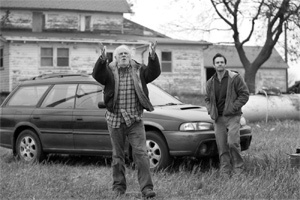 Director Alexander Payne’s Nebraska practically begs to be admired by cinema buffs and critics. To begin with, the movie — set in bleak towns of the Midwest — was shot in black and white, a retro move that can be seen as a defiantly bold stroke. Just as significant, Nebraska boasts a fine and flinty performance from a 77-year-old actor, Bruce Dern. The plus: It’s always nice to see a sagging career reinvigorated. To further add to its cinematic bona fides, Nebraska exudes a sense of wistful melancholy, emerging as a slightly cracked ode to a vanishing America. The story takes place in towns made sparse by the absence of everything from tempting upscale malls to well-stocked big-box stores. The landscapes and towns in Nebraska seem to have slumped into a state of spiritual and material exhaustion. It’s hardly surprising that the characters who inhabit these landscapes can feel similarly depleted. I guess I’m saying that there’s plenty to admire about Payne’s latest road movie, but I’m not totally on board with the effort. Look, Nebraska has significant rewards (Dern’s performance, surprising jolts of humor and a quietly moving father/son finale), but the movie also can feel burdened by a sideshow quality that makes some of its characters seem as if they’ve been imprisoned in a grotesque Midwestern diorama. The story centers on Woody Grant (Dern), an aging alcoholic who receives a magazine promotion in the mail, and believes he has won $1 million. No longer in a possession of a driver’s license, Woody sets out to claim his prize by walking from Billings, Montana, to Lincoln, Nebraska. Clearly, Woody’s running short on mental acuity. He’s quiet, withdrawn, perhaps a bit demented, a man whose good old days probably never were all that good. And that’s part of what makes Dern’s performance so convincing. He captures the hollow vacancy of a man whose memory has begun to fail. It’s as if half of him already has left the planet. After unsuccessful attempts to talk his father out of a perilous journey, Woody’s son Dave (Will Forte of Saturday Night Live fame) decides to drive his dad to Lincoln. Dave knows the “sweepstakes” prize is a bogus come-on designed to sell magazine subscriptions, but he indulges the old man’s fantasy. Maybe Dave hopes that an extended road trip will provide an opportunity to bond with his emotionally remote, sometimes cruel father. Besides, Dave’s at loose ends, having just lost his fiancé. Thankfully, Woody and Dave don’t spend the entire movie in a car. They make an extended stop in Hawthorne, Nebraska, the bleak town where Woody grew up. Woody’s family — the folks who remained in Hawthorne — acquires traces of freak-show distortion, particularly his two nephews, bestubbled dolts whose entire conversational repertoire consists of mocking the length of time it has taken Dave to drive from Billings to Hawthorne. Once word gets out that Woody has won $1 million, the covetous Hawthorne townsfolk cozy up to him. Ed Pegram (Stacy Keach), a former business associate, insists that Woody owes him a substantial sum. Just about everyone wants to feed at the trough of Woody’s supposed good fortune. Many of the scenes in Hawthorne are played for laughs as Dave becomes increasingly protective of his father’s sad fantasy, a tacit recognition that his father’s hope — though built on a false foundation — might be all the old man has left. The movie receives a considerable boost when Woody’s wife (June Squibb) shows up in Hawthrone to spew some venom and speak unforgiving truths about the town’s residents, both living and dead. Squibb’s Kate Grant adds one of the movie’s livelier touches, although some of her dialogue can be seen as the kind of cheap trick you’d find in lesser movies: the supposed shock of hearing an older person use profanity, for example. Forte holds his own, as does an underutilized Bob Odenkirk (familiar from TV’s Breaking Bad). Odenkirk plays Dave’s brother. As an anchor on a local TV news show in Billings, Okenkirk’s Ross seems to have trumped his brother’s meager professional accomplishments. Dave works in a stereo store. For me, Nebraska felt like a backward step from Payne’s work in movies such as The Descendants, Sideways and Election. Falling more into an About Schmidt mode, Payne — working from a script by Bob Nelson — tries to alleviate some of his comedy’s bitter sting with an ending steeped in sentiment. At times, Nebraska feels as flat and uninflected as the landscape over which it travels, but fortunately for Payne, the movie’s small-triumph ending pretty much works. That puts Nebraska in a weirdly incongruous class of its own: It’s a dreary crowd-pleaser of a movie.